JoeYesterday was the official start to the Christmas season in Uppsala, as the downtown lights coming on for the first time. 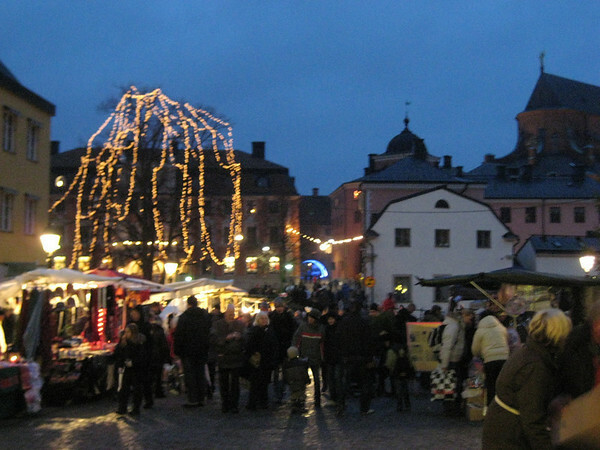 The event was also marked by a profusion of street vendors throughout downtown, as well as a more official Julmarknad in St. Erik's Torg (an old square below the cathedral), and a number of sales. Eager to see Uppsala's version of Black Friday, we headed downtown in the afternoon to catch a bit of the excitement. The streets and shops were indeed packed with people, and the lights were all on, so it was quite festive. It was around 2:30 when we got downtown, so we still had 30 minutes until sunset. 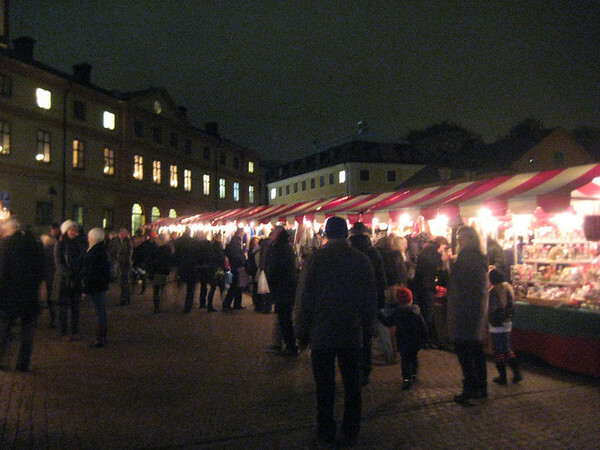 We made the best of it by sampling some of the street food, stopping for a free cup of glögg offered by the Army Women's Reserve Corp, and a couple of donuts from the "American Donuts" stand (they were… closer than anything else we've had here). Then we hit a couple of shops, mostly looking to pick up a bit of seasonal decoration for the apartment—and did we ever succeed! On our way to the market, we ran into one of Jennifer's coworkers who mentioned that Uppsala's fanciest restaurant, Domtrappkällaren, was serving his favorite dish (stekt strömming med potatismos och lingonsylt) on paper plates from it's kitchen door. As it happened to be on our way, we decided we should risk it, and indeed it was really good. The market itself was just the sort of Christmas crafty stuff you would expect, some of it nice, some of it a little cheesy, all of it out of our price range. So we watched the litte kids taking pony rides, listened to the choir singing on the church steps, ate a hot dog purchased from the Amnesty International booth, and basically soaked up the atmosphere. Last night was also the last night of a month long art project in Uppsala, an attempt to brighten up the dismal November evenings by putting up a series of light-themed artworks around town. As it was now a couple of hours after sunset and the vendors were all packing up, we decided to walk past a few of the light displays. 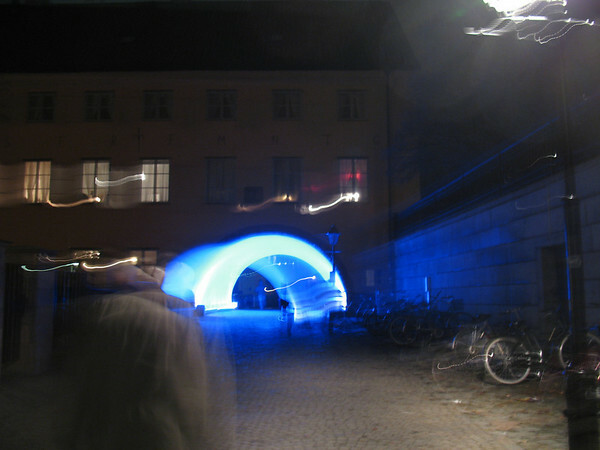 The highlights were the University building, dramatically lit in shifting colors; Valvgatan, an old building with a large archway over a pedestrianized street which was glowing with blacklight; and an art gallery down by the river, which was projecting artwork onto the river wall accompanied by atmospheric music. By then it was getting on towards 6 o'clock, and in the cold and the dark things were really winding down, so we headed home. It was a lot of fun, though.